During a Christmas Eve party in 1996 we were into the final drinks of the after dinner drinks portion of the evening. We were barely capable of forming compound sentences but alcohol inspires many great notions. Since we serve Cajun File Gumbo for Christmas Eve we talked about the sausage contribution to that cuisine. This quickly led to the larger discussion of sausages from around the world and how they are a vital natural resource. It’s like wind power without the media fawning attached to the next Big Thing. With a professional psychologist present we figured the persons attracted to eating sausage were those people who were not purist, vegetarians, organic farmers, health food Nazis, or squeamish about putting good tasting things into their mouth. This narrowed the universe of people down to a nice twisted segment of the population. After that we just needed to find a special day that would appeal to this unique population of lost souls. 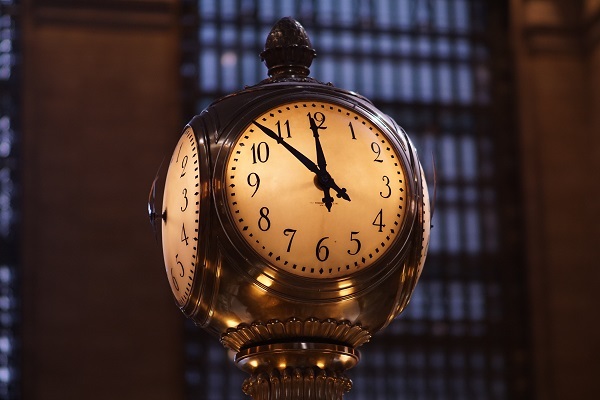 In the US we have either not enough or too many three days weekends. Labor Day weekend seemed like a perfect time for a Sausagefest. At the end of summer, people who were still around their house on the weekend needed a reason to stay behind. 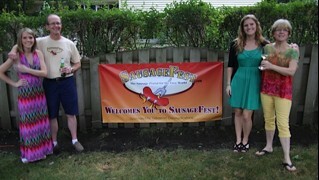 As you can surmise, Sausagefest does not have any airs to appeal to the upper crustaceans of society. 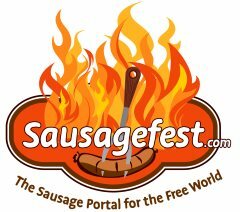 We have determined that we needed to reach out to the world, leave behind what was essentially a friends and family website, and make Sausagefest the Sausage Portal for the Free World.